The Soundhole and Rosette Routing Jig works in conjunction with our Precision Router Base to allow you to cut guitar and ukulele soundholes and rosette channels with your dremel. 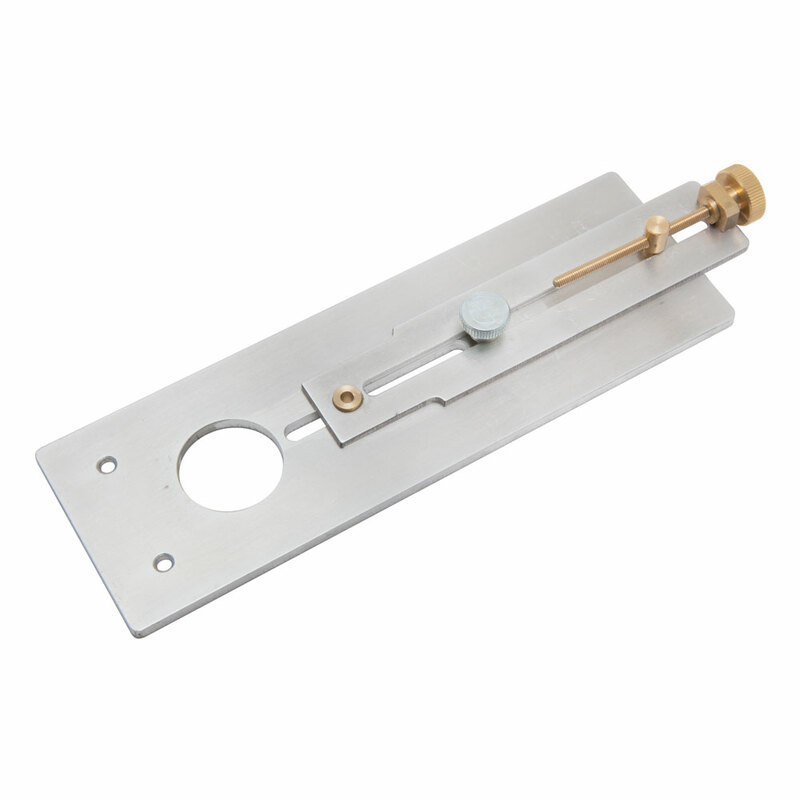 Made from aluminium and brass, the jig rotates around an indexing pin to form a circle and the diameter of the circle is adjustable from 48 mm to 160 mm (1.9" to 6.3") via the brass thumbscrew and then locked in place using the top thumbscrew. 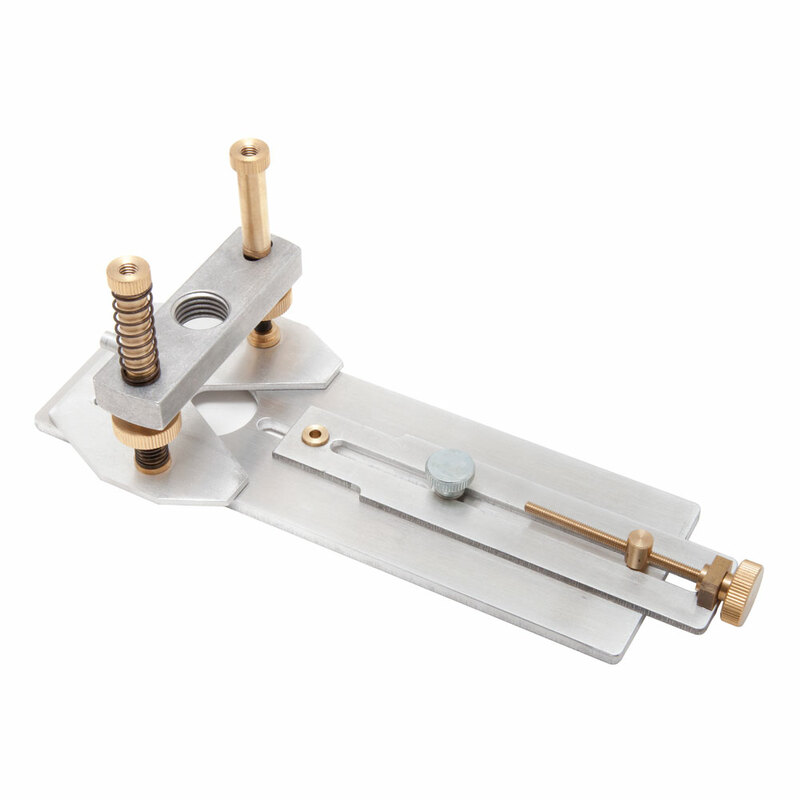 Two screws are included to mount the jig to our Precision Router Base (sold separately). To use the jig you will need a base board big enough to support your soundboard, 18 mm (3/4") thick plywood or MDF is ideal, drill a 4 mm (0.16") hole in the soundboard in the centre of where you want to cut the soundhole/rosette, place the soundboard on the baseboard and mark and drill the corresponding hole in the base board as well. Ensure these holes are drilled perfectly vertical and with a snug fit. Place the jig and soundboard on the base board, insert the indexing pin through the brass eyelet in the jig and through the soundboard into the jig, ensure the jig rotates smoothly around the indexing pin. Practice on scrap before cutting the soundboard.